East Second Street Christian Church was originally founded in 1851 by Pastor Thomas Phillips, a former slave. The first service was held in a carriage factory at 112 West Fourth Street which was bought by Pastor Phillips with the help of his former master, John Brand. In 1874, the carriage factory was rebuilt and constructed out of brick. The church then moved to its present location, 146 Constitution Street, in 1880 sitting in the Constitution Historic District. Pastor Phillips served as the leader of the thirty-five member congregation until his death in 1859. During the renovations and moving, East Second Street’s congregation grew to over three hundred members, and in 1957 Reverend O.B. Garner became the head pastor. He served in this position for 37 years. Over the years, the church has had 21 different pastors, including current pastor, Donald K. Gillett, II. In 1884, Consolidated Baptist Church was founded on Rose Street by civil war veteran, Alfred Britton. In 1895, the church merged with Macedonia Baptist in Adamstown, a predominantly African American community located at what is now Avenue of Champions. A new sanctuary was built in 1923 and was dedicated in 1927 on South Upper Street. As the church began to grow rapidly, the congregation purchased twelve acres of land on Russell Cave Road where the church is currently located. Saint Paul African Methodist Episcopal (A.M.E.) Church is located at 251 North Upper Street in Lexington, Kentucky. According to the church website, Saint Paul’s A.M.E. Church got its start after several members of another congregation -Hill Street Methodist Church- rented a stable on North Upper Street from a banker named Charles Wilkins. The first meetings of were presided over by a local black preacher named William Smith, who was able to continually increase the number of members so that by 1827 they were able to buy a building – a former stable and the surrounding lot for a sum of $280.00. The simple stable would end up facing major remodeling over the years 1850, 1877, 1906, and 1986. It is believed that part of the original stable remains in the basement of the current building that Saint Paul’s A.M.E Church holds meets today. Saint Paul has a long-standing history of community involvement. Members remember that during World War II, the American War Mothers frequently met at the church. There is nothing on their website regarding the Civil Rights Movement, however. Saint Peter Claver Catholic Church is the largest and first African American Catholic Church in Lexington, Kentucky and is also one of the oldest black Catholic churches in Kentucky. Prior to 1887 there was no African American Catholic church to help serve the black community of Lexington. In order to change this, a school was founded in 1887 on the corner of Fourth Street and Jefferson Street as a way to address the problems facing the black Catholic community. This location is still the location of the present day church and school. Four years after the creation of the school, a small chapel was built in 1891 and was named to honor Saint Peter Claver, a Jesuit priest who had converted many Africans to Catholicism (see more on this at the Knights of Peter Claver website – Lexington’s chapter is Court #233). This was the beginning of the first formalized Catholic Church for the African American community in Lexington. This small chapel on the second floor of the school served as the place of worship for the community for 57 years, until in 1947 construction on a new building began. Father Frederick Bamberger was the priest at the time of construction and the building was fully erected by December of 1948. The building operates as the church today and is positioned directly next to the old school building. The original school that was formed in 1887 was established by the Sisters of Charity of Nazareth and despite being run by Catholics only 20 of the original 296 students were actually Catholic. In 1942, the Sisters of Divine Providence took over the school and in 1948 a Catholic High School was created and lasted until the end of segregation and schools became integrated. 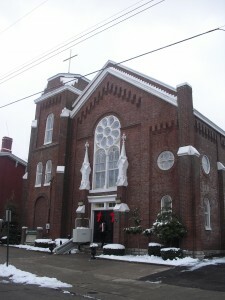 The church was also the original home of the Montessori School that is now located on Leestown Road and is named the Providence Montessori. The history of Black Churches in Lexington i s very intriguing and provides individuals with information on landmarks, history of ownership, land development and a basis to move forward to the future with knowledge and resources.